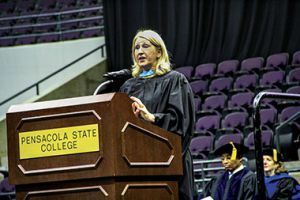 Nearly 1,300 Pensacola State students received degrees and certificates during the College’s fall commencement exercises held Sunday, Dec. 16, at the Pensacola Bay Center. Florida Department of Education Commissioner Pam Stewart was the featured speaker at the graduation. Pensacola State President Ed Meadows conferred bachelor’s degrees, associate degrees and certificates to 662 summer and 637 fall graduates during the ceremony. Since the College opened in 1948, more than 109,244 students have graduated from Pensacola State. Before being appointed commissioner in 2013, Stewart served as Deputy Superintendent for Academic Services in St. Johns County, during which time the district was the highest-performing district in the state of Florida. In addition, in 2004, she was recruited to join the Florida Department of Education’s Division of Public Schools as Deputy Chancellor for Educator Quality. She holds a Bachelor of Arts in Elementary Education/Early Childhood from the University of South Florida and a Master of Education in Counselor Education from the University of Central Florida. During the commencement processional Susan Morgan, head of PSC’s history, languages, social sciences, and education department, served as the grand marshal. Faculty Marshals were Butch Branch, Milton’s campus L.I.F.E. Center and student leadership and activities coordinator, and Michael Listau, head of the Applied Technology and Professional Services. Serving as Student Marshals were College Registrar Susan Desbrow, director of admissions, and Judy Floyd, director of student services on the Warrington campus.